The Sandstone Trail passes through a variety of carefully managed habitats that are attractive to Britain’s native reptiles and amphibians. Along the way, sharp-eyed and patient walkers may be lucky enough to spot common lizards, grass snakes, adders, slowworms, frogs and toads. The reptiles like the quieter parts of vast Delamere Forest and its outliers, as well as protected patches of valuable lowland heath at places like Bickerton Hill. Cheshire’s amphibians are lucky that this is such a watery county, rich with flooded marl pits, field ponds, mosses, lakes and meres. Common lizards and grass snakes can often be seen in the less-frequented parts of Delamere Forest such as around the boggy fringes of Hatchmere and Linmere, and among the dense plantations of Primrosehill Wood. For adders, slowworms and common lizards, one of the best places in Cheshire is Bickerton Hill, particularly the wetter parts where their prey prefers to live. Common lizards are often seen on Bickerton Hill, and at the back of Hatchmere. 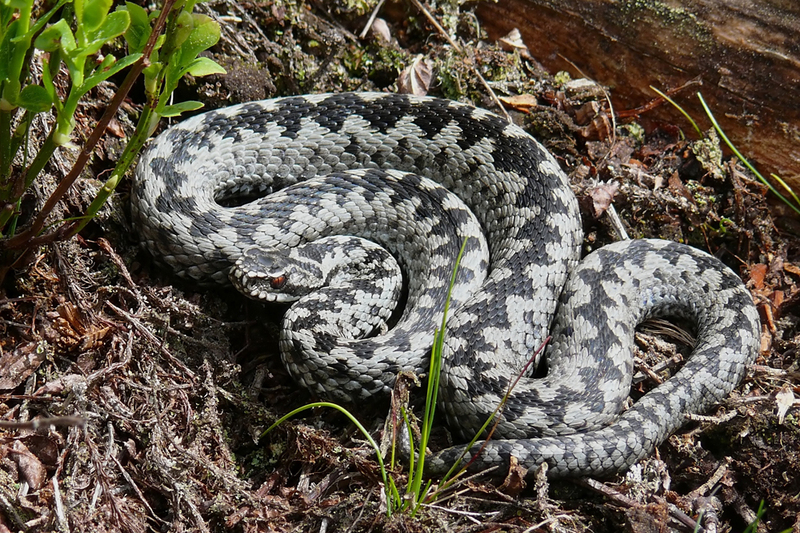 Adders have also been reported in the quieter parts of Delamere Forest. Frogs and toads are widespread throughout the less intensively farmed parts of the Cheshire countryside. For most of the year they spread out onto their feeding territories, but gather together in early spring to mate and lay their eggs in Cheshire’s many ponds and pits. Look for their massed gelatinous globular frogspawn in ponds in March. You may also be lucky enough to see toad spawn, distinguished by its long, tape-like strings.